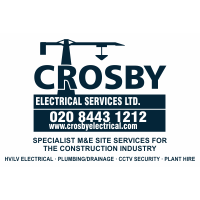 We are a main supplier of stickers, labels and decals to the Engineering Contractors Industry. 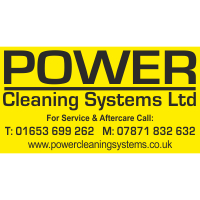 With over 70 years experience, we have the right product at the right price for your needs. One of the cheapest forms of advertising is having your logo printed onto stickers. We can print any design to any shape on high grade exterior quality vinyl. The inks are all UV stable making sure they won’t fade and will stay vibrant for years to come. 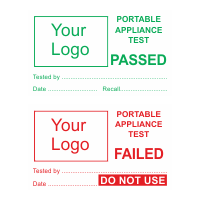 Not only do we produce PAT stickers, we even include your logo in the design so that while doing these essential checks and tests you will also be advertising your company. 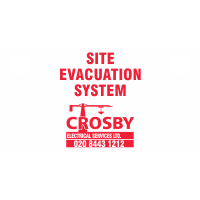 They are supplied on easy peel sheets and printed on a matt white vinyl which can easily be written on with ballpoint pen. 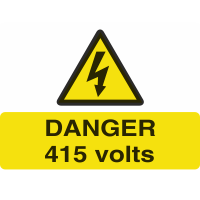 We are able to produce all sorts of Danger voltage stickers, all of which are fully waterproof and UV stable so you can be sure that these will last for years warning people of the potential risk in that area. 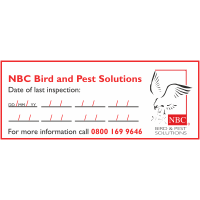 Printed on a matt vinyl which can easily be written on with biro or marker pen, these Date of Inspection stickers are perfect for reminding your customers when they need to book their inspection in. Supplied in your bespoke design we can do any size required and print any amount of colours. 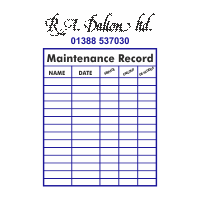 Just like the Date of Inspection stickers, these Maintenance Record stickers are printed on a matt vinyl which can easily be written on with a ballpoint pen. Supplied in your bespoke design we can do any size required and print any amount of colours. 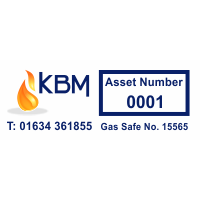 If you need to keep track of your equipment then we can give each sticker a sequential number. This will speed up the identification process of your items and in most cases it doesn’t cost any extra. 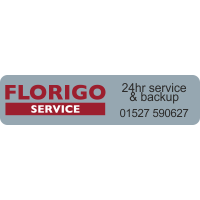 Another good sticker form to keep track of your items and equipment, these writable stickers are printed on a matt vinyl which are weatherproof and will last. The perfect way to keep tabs on your items. We print on the underside of a tough polycarbonate which provides added protection and life. 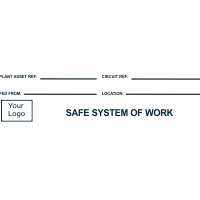 These stickers are ideal for harsh conditions. As the print is behind the special film, it cannot be scratched off or removed with thinners. 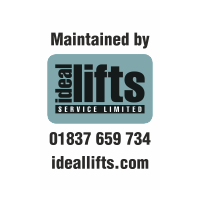 Available with a range of adhesive strengths these stickers are a popular choice. Quality, durable and long lasting plastic tags. 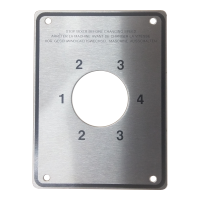 All our tags are printed to your design either on one or both sides and come with or without holes and eyelets. Printed on a polypropylene for extra durability outside in low temperatures. We have a range of materials available that provide resistance up to +150°C. 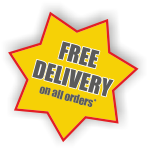 Heat proof stickers are ideal for sticking to exhausts, engines, boilers, cookers, anywhere that gets hot. So for those situations where resistance to high temperatures is required, give us a call to discuss the best material.